One of the most time-honored and favorite patterns available in men's and women's clothing, argyle has been associated with wealth and class since it first became widely available in the 1800s. Defined as a diamond pattern made of 2 or more colors, argyle was named after Scotland's Campbell of Argyll clan, since the pattern is an adaptation of the tartans worn by this clan. In the late 1920's argyle became associated with golf when some well-known golfers, most notably the Duke of Windsor, began to don the pattern on the golf course. 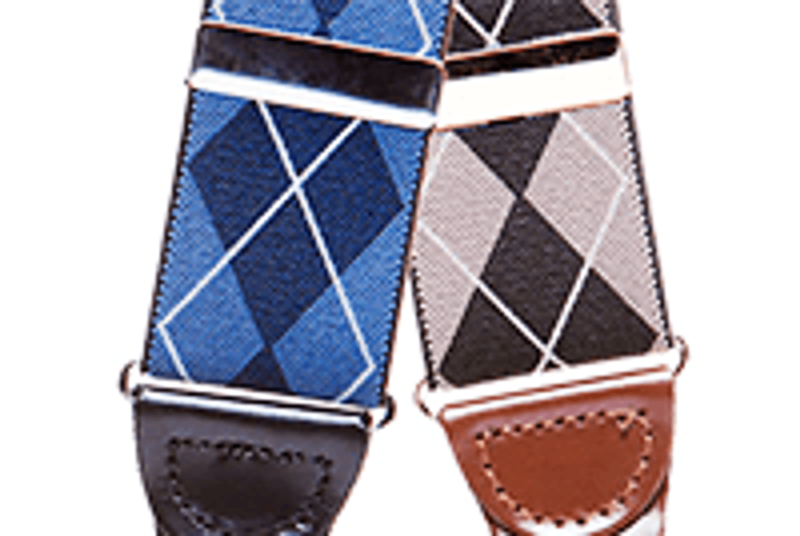 SuspenderStore is proud to offer a variety of argyle suspenders in both clip and button-on style so you can incorporate this sophisticated and classic pattern into your business and casual attire. Our handsome argyle suspenders at the SuspenderStore are available in clip-on and button-attachment styles to fit your lifestyle and fashion preferences. The two-tone diamond pattern of our argyle suspenders is adapted from the tartans worn by the Campbell of Argyll clan in Scotland hundreds of years ago. The Duke of Windsor made argyle popular on the golf courses of Great Britain in the 1920s. America has since embraced the distinguished look of argyle in best-selling men's fashions. Deep burgundy and blue create the diamond pattern on our burgundy argyle suspenders with clip or buttonhole pants attachments. The ultra-comfortable elastic used to craft these braces is 1.38 inches in width. The 46-inch length fits 5'2" to 6'1" adult heights. Choose this button suspenders style in three additional color combinations. Our brown argyle clip suspenders have a pattern of darker brown and lighter brown shades with narrow white line accents. Brass clips and hardware give these braces a distinguished look for big city business meetings or dinner at a weekend hunting lodge. Leading designers have introduced them in recent years as a contemporary pairing with jeans and white button-downs. A popular look with brown or beige suit jackets is our olive green argyle shirt suspenders that can handily transition from urbane business suits to country gentleman men's fashions. These 46" long olive suspenders with Y-back construction also add sophisticated flair to weekend jeans or khakis. Click on our style guides to help you decide on the best size and the right style for you. Clip-on suspenders, for examples, often are viewed as slightly less formal than traditional button-on suspenders. Our suspenders are only crafted with premium-quality metal clips. However, the most secure pants attachments are buttonhole attachments. Clip attachments are more convenient for men whose pants don't have suspender buttons at the waist. One of our suspender style guides is a how-to guide for sewing buttons onto slacks.